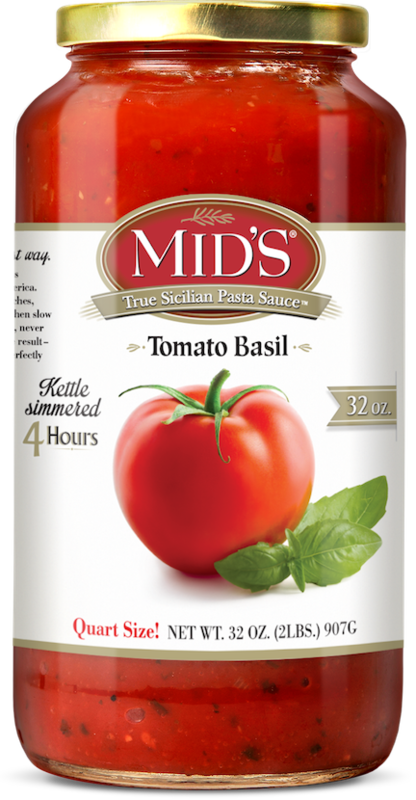 The flavors, the freshness and ahhh, the wonderful aroma — senses come alive with MID'S Tomato Basil sauce, our fastest-growing variety. Chunks of tomatoes give it a pleasing texture, with fresh basil providing a sweet, savory right-out-of-the-garden taste. Tomato Basil is a complement to any meat or fish dish. Perfect for wholesome, vegetarian pasta dishes too. Ingredients: Water, Tomato Paste, Tomatoes (Tomatoes, Tomato Juice, Salt, Citric Acid, Calcium Chloride), Sugar, Olive Oil, Salt, Onions, Romano Cheese (Made From100% Pasteurized Sheep’s Milk, Bacterial Culture, Salt, Rennet), Spices, Garlic, Citric Acid, Basil, Paprika.